The first public demonstration of agility was at Crufts in 1978 and very quickly became established as a popular activity with dog lovers of all ages participating. It is a wonderful sport, allowing dog owners to have fun with their dogs, to learn to work together, and hopefully win rosettes and trophies on the way. Another reason, I think, for its popularity is that there is no need to invest in expensive equipment to take part. 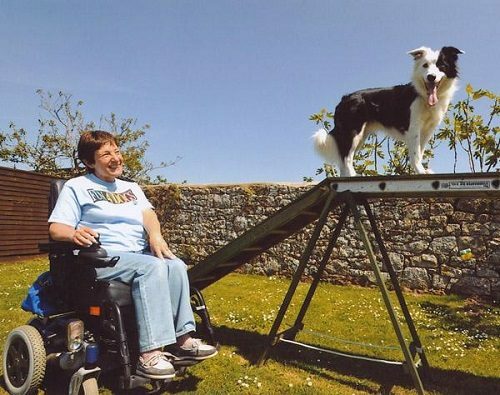 You and your dog, that’s all you need, says agility enthusiast Richard Partridge. It is not known when the first disabled person felt the lure, but around 20 years ago Philippa Armstrong, who suffered from Rheumatoid Arthritis, joined in the fun. Although she was normally dependent on a wheelchair she initially struggled without it. She eventually decided that there should be no earthly reason why she could not train in her chair so took the decisive step. She could not find any trainers with experience of her special needs, but eventually tracked down somebody who was prepared to take on the challenge. With her new trainer, she soon started to compete, quickly discovering that she was the only wheelchair-bound competitor in the UK. Philippa has gone on, despite her increasing health problems, to champion the cause for providing facilities and opportunities for disabled handlers and has become very well known and respected on the circuit. My first involvement with Paragility came in 2006. My wife, Sheila, was suffering from Arthritis in her knees which severely restricted her ability to run, and more particularly to quickly change direction which is a fundamental need in agility. We found ourselves chatting to friends at a show and it materialised that these ladies also had problems with mobility, although not to the extent that they needed any physical aids. One of them had learned of a competition which was to be held in the Netherlands for disabled handlers. When we were home I followed this up and discovered Paragility World Cup (PAWC) which was indeed to be held in the Netherlands over a weekend at the end of August. The venue was in Amersfoort, which by serendipitous coincidence was adjacent to the town where we have Dutch friends. This opportunity to kill two birds with one stone so to speak was too good to miss; we could enter the competition and visit our friends, so we followed it up. We learned that this was a “twin” competition between PAWC and International Mix & Breeds Championship Agility (IMCA) which took place together. Not being disabled myself I could enter IMCA with my own dog but our own experience of PAWC was wonderful. We enjoyed a very warm welcome and immediately felt we were fully paid up members of the Paragility community and soon made new friends among the international agility community. Although our competitive successes were modest to say the least we left full of enthusiasm for this wonderful event and on our return home set about increasing the awareness of it. The IMCA started in 2000 at Parma in Italy, organised by Patricia Fuchs and only for cross-breed dogs before the rules were changed in 2002 allowing pedigree dogs to participate. “The 1e ParAgility World Cup took place on 6, 7 and 8 September 2002 in Gyula, Hungary together with the 3e International Mix and Breed Championship Agility (IMCA).It was organised by Gyulai Kutyás Agility Szabadidõsport Klub and the first ParAgility World Cup was set up by Sándor Alt. I represented the Netherlands in an electric wheelchair together with my dog, Quita. When I first heard about this world championship I was very enthusiastic and started to find competitors. I sent hundreds of emails to dog training groups and relevant organizations. It was not an easy task to find enough competitors, but just a few weeks before the competition started I managed to have 10 handlers and 11 dogs willing to participate!”. Since these modest beginnings PAWC has grown steadily and visited many European countries including Holland, Spain, Italy, Switzerland and Belgium. Most recently, in 2014 when we visited Italy there were a total of 81 competitors from all over the world, including representatives not only from most European counties but also Canada and Japan. The UK sent our biggest team to date with 6 handlers running 10 dogs. This means that everybody is competing against others with similar abilities and given an equal opportunity to succeed. There are also very strict regulations regarding the venue to ensure that there are adequate facilities for disabled, as you can imagine. Parking, access, toilets and running surface are all key areas considered when venues are being chosen, and the design of the courses themselves have to be negotiable with wheelchairs and for the less agile, whilst being sufficiently challenging. The UK was not represented the following year when the event was held in Spain, except by Graham Partridge and in 2008, the UK took 3 competitors to Italy, but all IMCA, no Paragility/PAWC entrants. This changed in 2009 when Sue Drew, a lady suffering from MS and confined to a wheelchair, took her Collie, Harry, to Hungary. This is a considerable trip for anybody but Sue, with her husband Dave, was not daunted and despite various travails made the journey. As with us her competition results were not world shattering, but she joined the growing group of UK Agility folk who were enthusiastic about PAWC. She was extremely well cared for by the other teams, especially the Dutch, and immediately made long lasting friendships. 2010 took us to Switzerland and joining us for the first time was David Maylam who is an experienced all round dog trainer and an agility enthusiast. Sadly Parkinson’s Disease has resulted in limiting his own agility and he has needed to adopt fresh thinking to continue in the sport. This has resulted in him becoming very adept as distance handling where he can direct his dogs mainly by voice from quite far away. Sue was on her way to join us but very unfortunately her dog, Harry, developed kennel cough a few days before the event and they sadly had to withdraw. As an illustration of the feelings of support and friendship in the Paragility community when the news broke that Sue was not to be with us some of the friends made in Hungary the previous year were literally in tears. Again, trophies evaded our gallant team, but the net was spreading and we were anticipating greater things to come. The Netherlands welcomed us back in 2011 for the 10th PAWC event and the UK fielded their team, once again increasing in size with both Sue and David, and this time welcoming Jane Clark with her Spaniels. Jane, like Sue, suffers from MS, but fortunately she was still able to walk with the aid of sticks. Although new friends were made and old friends reunited, there were no trophies to grace our cabinets. Belgium hosted the 2012 event, where to join Sue, who by now had a new dog, was Katie (who was only 3 weeks above the minimum age to compete). Sue had her doubts whether to enter until I asked her if she was going solely with the intention to win or to meet her friends and to enjoy a wonderful weekend of our favourite sport. With Sue were David, running three dogs, Jess, Max and Fudge, and Jane with Ronnie. New member, Angela with her dog, Bizzy, were also competing. Angela had been a keen supporter of PAWC and been a prime force in much fund-raising over the years, but this was to be her first opportunity to experience “up close and personal”. Feeling very excited, we were keeping our finger crossed for our first podium places. Sue and Katie did astonishingly well considering the extreme youth and inexperience of the dog, although won no medals. David set his dogs round the courses with such amazing skill that other teams invited him to visit them to help their training, but sadly by hair's breadths they failed to make the top spots. It’s fair to say that Jane and Ronnie are not able to cover the ground quickly and lost out on time, but the whole team were full of excitement for them, their performance was far better than previously in Holland demonstrating Jane’s increased ability to overcome her disability and complete the courses with clear rounds. Our new girl, Angela, was our dark horse. She is an experienced handler of many years standing but suffering from acute and chronic asthma makes her unable to rush around the ring. She has learned distance handling and was able to test herself here. The first run did not go too well, as she said after the run the atmosphere and noise, although friendly, supportive and well meaning put her off which meant her control of Bizzy was not as accurate as she hoped. Obviously she came to terms with this and blasted her second run to third place and capping that in the third run with a second. The UK has reached the podium - a great weekend! The following year, 2013, we had a long journey to the far side of Hungary. Despite the challenges and cost of this 1,200 miles each way we once again fielded at team, and again with more competitors than in the past. Angie, our podium sitter of last year, could not be with us but Sue, Jane and David made it. We all enjoyed a wonderful welcome to Guyla, one of the highlights being a parade through the city where it seemed that the entire population turned out to watch. Jane had some fine runs but missed the places. Although David also did not get any prizes their dogs had some stunning runs, one was the fastest in class but an over enthusiastic Collie missed his contact earning five penalties. To his delight he was later approached by some of the foreign teams inviting him to train them. With their increased experience Sue and Katie looked promising and did not fail to deliver with two stunning second places. More cheering, more tears and lots of hugs, as you can see in this video recapping the event. Our fame was spreading and last year, 2014, we had 3 new members. Sadly David and Jane could not be with us, but as David had to withdraw at the last moment after his entries had been accepted and we were allowed to run his dogs with other handlers. Bravely he and his wife, Dianne, waved off the dogs on their trip to Italy. The full team consisted on our regulars, Sue with Katie and Angie with Bizzy. Joining us were Frances and Sky, Milie with Riot and Cruise, and Amanda with Maisie. Sue also ran one of David’s dogs, while Amanda and Milie ran the others. We felt we should be a strong team, by now we had experience of the event and some of the new members had successes in main-stream agility, but only time would tell. The first day when the course was Agility was exciting, but did not deliver. Day two brought the Jumping event, and we were all ready to support and cheer. It was just as well we were prepared and Frances and Sky, having obviously got the measure of the surface and the atmosphere the previous day, the duo came in a brilliant first place. The first gold for Team UK, and the first time our National Anthem has been played – it was a moment to delight in. Milie was not to be out-done and ran brilliant rounds and proving it by being thoroughly greedy by taking both first and second. Sue just missed the podium with a 4th and all of the others put in creditable runs. Day 3 with the second agility run dawned with us full of expectation after the previous day’s superb performances. Sue gave us a brilliant start by placing Katie in second place in the wheelchair group, a well deserved place. This was followed by Milie, who determined to show the world that yesterday had not been a fluke placed Riot on the top step again. We were by now getting quite blasé about being on the podium and waving the flags, but still the excitement was tangible. Both Angie and Frances were faulted so could not score. This left Amanda with her two dogs to run last in the UK Paragility Team; our last chance for glory. She ran Maisie first but was faulted, but in fairness both dog and handler are new to this sport and Maisie in particular was affected by the noise and atmosphere. Then came the time for Max’s run. Bear in mind that the dog’s owner was 800 miles away and that dog and handler had not met until a few days previously. Amanda put Max on the line where he sat patiently waiting for the signal to go. Upon the signal he shot off like a rocket, except this particular rocket had ears and a brain which he used to the best of his brilliant ability. The result was a clear round in a stunning time over 2 seconds faster that his nearest rival. Team UK exploded. I’m sure our cheers could be heard back home, and I think his owner, Dianne, who was watching on the streamed video link, could have been heard by us if we were a bit quieter. Amanda was the quietest member of our team, but then it’s difficult to make a lot of noise when you have dissolved in tears of joy. When the final tally was completed it emerged that on top of our individual successes Sue and Katie were second overall, as was Amanda with Riot. We entered 10 dogs in four classes, with a total of 40 medals to be won. We took home seven, of which four were first places. A truly satisfying result. To sweeten the cherry even more our IMCA team scored its first ever podium places with two second places and a third, with Bonny making a superb second overall in the 'small class'. In this I have described the competition side of Paragility. This however is only the tip of the iceberg. It would be fair to call this gathering a Jamboree, a meeting of like minded people to enjoy the mutual company and indulge in their favourite pastime. A newcomer to the IMCA competition said that it was a real eye-opener. She very quickly realised that the disabled folk were as passionate about the sport as the rest of us, but in able to achieve the results they need to work much harder. Over the years I have been going to 'IMCA – PAWC' I have made many friends and gathered many stories. The one thing that is always foremost in my mind is the great spirit of happiness among all of the competitors. I remember once chatting to a lovely German girl, Carola Wehner. She suffered a serious knee infection which resulted in her losing her left leg and being fitted with a prosthetic aluminium one . She always runs in shorts and previously worn trainers. In last year's event she had progressed to a blade. As we sat chatting and laughing about the problem of her dog refusing to accept that she could not run as fast, hence she had to find ways to, she was non-chalanctly unscrewing her lower leg and fitting the one with the trainer foot. Another regular is Bella Weiss with her little dog Shuba. Bella is wheelchair bound, full of life and always laughing, so drives her electric chair very quickly, in fact it has been specially tuned for her, and has to wear a full seat harness to keep her in during some of her frantic turns and braking. Sharon Palmer makes the pilgrimage all the way from Canada. Normally her dog, which is trained in distance handling, blasts the course regularly winning her classes. At the last event in one run however the dog would not go on. When we enquired if the dog was alright Sharon told us that she herself was in great pain and that the dog knew and would not leave her. Agility is a sport enjoyed by tens of thousands of people. It is an opportunity to have fun with our dogs while we train them and increase the bond between us and if we compete maybe win rosettes and trophies. Sadly there are very few disabled among our numbers. But I know of many clubs where less able members would be welcome, and the trainers will be pleased to meet the extra challenges which this would bring. In this day and age Para-sports of all types is becoming a reality and much more available. If you are interested in taking this up I would heartily suggest you find a club near you and approach them. You may not be lucky first time, there are all sorts of clubs, some cater for all and train newcomers whereas others concentrate on completion grade handlers only. To shamelessly quote Susan Rekveld’s motto, “Agility on Wheels, That’s Fun”! If we’ve inspired you to get involved you can find out more about Paragility online at www.para-agility.nl or you can read more about IMCA on Facebook here where you can discover more about the team mentioned here.